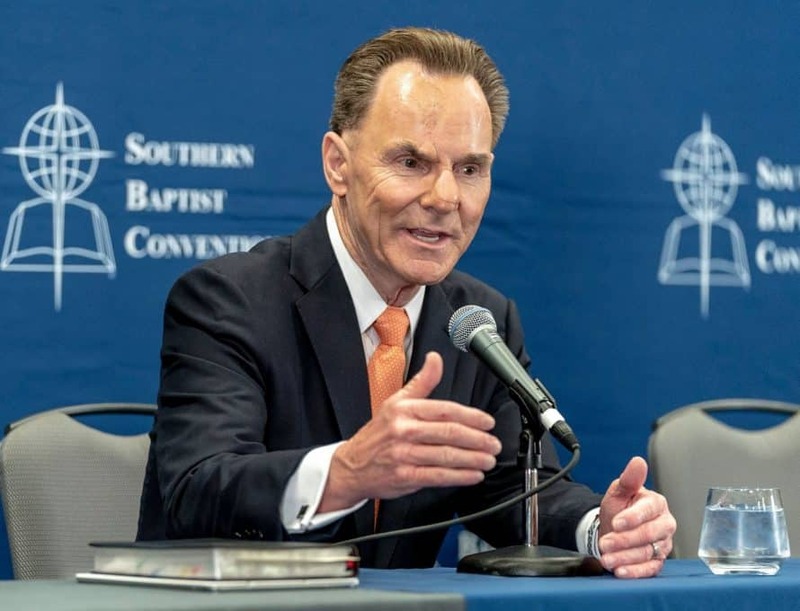 DALLAS (BP) – The Great Commission, the Cooperative Program, supporting pastors and listening to Southern Baptists will be among the early emphases of Ronnie Floyd’s presidency at the Southern Baptist Convention Executive Committee, he said during a press conference and a Facebook Live session April 2. In his Facebook Live session, Floyd also emphasized his support for SBC President J.D. Greear’s efforts to combat sexual abuse in churches. Southern Baptists must “do everything we can” to help victims and resource churches to prevent abuse, he said. Southern Baptists seem poised to unite at the 2019 SBC annual meeting in Birmingham, Ala., and make “as declarative a statement as we can make to our culture about what we believe about this issue” of sexual abuse, Floyd said. During his press conference, Floyd underscored repeatedly, in response to questions on a range of topics, his focus on the Great Commission – Jesus’ call in Matthew 28:19-20 and other Scriptures to make disciples of all nations. For the SBC, he said, the Great Commission is linked with the Cooperative Program, Southern Baptists’ unified channel of funding missions and ministries in North America and across the globe. “I will say again and again that our work together as Baptists to take the Gospel to the ends of the earth is dependent ultimately on our ability to prioritize and accelerate our giving through the Cooperative Program,” Floyd said, as well as the Lottie Moon Christmas Offering for International Missions and the Annie Armstrong Easter Offering for North American Missions. Championing evangelism and missions in his new EC role, Floyd said, is in keeping with the recommendations of the SBC’s Great Commission Task Force (GCTF), which Floyd chaired in 2009-2010. The task force presented a series of recommendations affirmed by messengers in 2010 and aimed at increasing the convention’s evangelistic effectiveness. The GCTF recommendations led to EC recommendations approved by SBC messengers in 2011. Local churches, Baptist associations, state conventions and the SBC all have sought to implement the GCTF’s recommendations, Floyd said. He commended state conventions for increasing their CP giving to SBC causes by more than 4 percentage points collectively since 2009-2010. Floyd will carry out his work at the EC with a pastor’s mindset and a love for local churches, he said, drawing from his 42 years of pastoral experience. “I will think like a pastor,” Floyd said. “I will champion pastors. I believe in the church, and I will champion the church” as “the body God has anointed” to accomplish the Great Commission. Among the ways he will support pastors and churches is by listening to them. Floyd noted his intent to listen and learn in the early days of his presidency in response to questions about the role of Baptist Press, a social justice emphasis among some Southern Baptists and Floyd’s participation in a group of evangelicals that has advised President Trump informally. Regarding Trump, Floyd said he has only been to the Oval Office once and would gladly relay evangelicals’ concerns to any president of either party, as past EC chief executives have done. Floyd’s Facebook Live message is available at www.facebook.com/BaptistPress/videos/2378018709094510/.